Stacey, the kids, and my mom and dad were in town today. They were a bit up in the air about their plans, but decided to make the trip – and I got a text about their plans mid-morning. Liz wasn’t feeling very well, and ended up going home from work during the day. But I was able to meet up with them after work in Chinatown, where we were having dinner at Ming Hin. Sadly, we learned on arriving that they don’t serve dim sum all the time (which was an assumption I had). On weekdays, they stop at 4PM (and pick up again from 9PM – 2AM, oddly enough). I also found out there’s a downtown location that serves all day. After our non dim sum dinner, we walked around a bit. 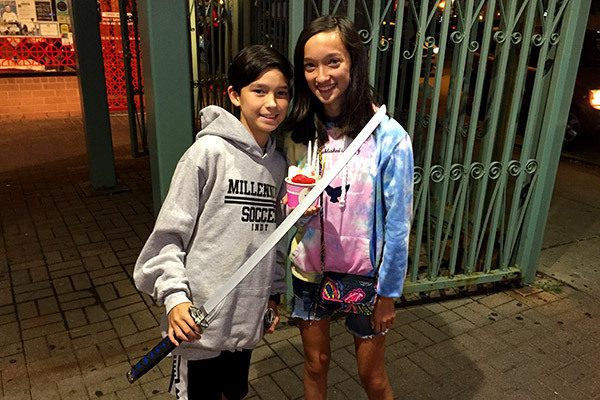 Jasmine got some rolled ice cream, and Jahnu was content walking around with a new sword he had purchased earlier in the day. Whenever I’m in Chinatown, I always think back to my excursion with Alex. 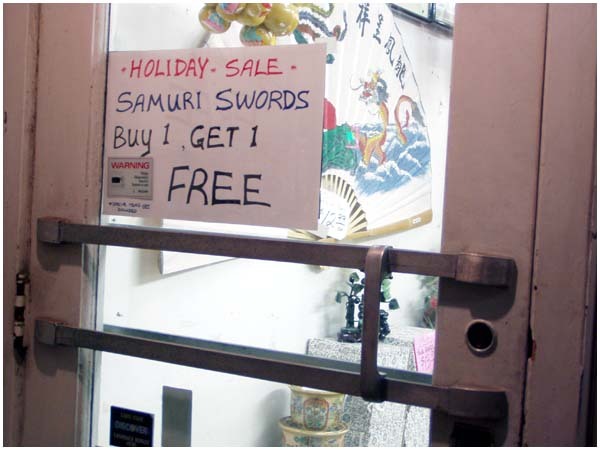 And Jahnu’s sword made me chuckle, as I remembered all the deals one can find in Chinatown, if you know where to look. Felix's Chinese name is Wei Tien. In English, it roughly translates to "Preserver of Heaven." Felix was in show choir in high school. He can still pull out the "jazz hands", thanks to muscle memory. Felix likes taking photographs of things, but then he ran into these folks... who put his camera to shame.